It was a bit of a challenge to pin down Marty Huggins, owner of Palmetto Moon Synthetic Turf, for a meeting. He’s always running to appointments with clients for estimates and to job sites because his business has taken off like, well, a moon shot. Huggins launched Palmetto Moon Synthetic Turf (based in Charleston) in 2007 when he saw a need for his product. His clients, which include residential and commercial properties, veterinarians and dog parks, among others, range in location from the Lowcountry to interior South Carolina and beyond. “We have just taken on a client in Charlotte, North Carolina. If it is worth it, we will travel a long distance to service our clients,” he said. Synthetic turf has come a long way since the early days of artificial grass, which was almost as hard as concrete and despised by card-carrying lovers of natural grass. Today’s synthetic grass (Palmetto Moon offers 70 varieties) is so realistic that it is difficult to tell the difference between it and the real stuff. The company’s turf offers trouble-free maintenance. Artificial lawns need no watering, mowing or chemical applications. 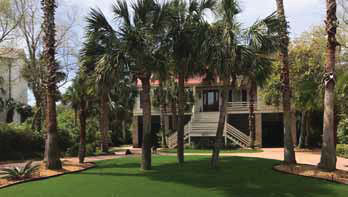 The turf Palmetto Moon offers is made of polypropylene with a urethane backing. “Our products have a warranty of eight to 15 years, depending on the company. The companies say their products will likely last 25 to 30 years. The payback period is between four to five years. 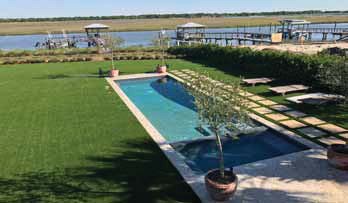 Many of our customers (some of which own historic homes in downtown Charleston and high-end dwellings on the Isle of Palms, Sullivan’s Island and Daniel Island), say they wished they had gone to synthetic turf a long time ago. Because of the soil we have and the fact that there are many oaks and lawns are shaded, it is very difficult to grow natural grass. We had one customer who sodded his property four times prior to going with synthetic turf,” Huggins explained. Huggins meets with each client to determine what variety of turf meets their needs and cost expectations. Crews then arrive to remove existing sod, and a permeable weed barrier is laid down and secured to the ground. The sub-base is able to accept a large amount of rain that flows through the porous top layer of turf. A high-quality adhesive and landscape pins are used to secure the seams of the turf. Edges are meticulously trimmed. A power broom is used to brush up the fibers of the synthetic grass and a spreader employed to drop infill into the grass fibers of the turf. Palmetto Moon does not use crumb rubber as an infill. Crumb rubber has raised health concerns, especially when used on sports fields. “We have handled jobs as small as a 100-square-foot courtyard on Daniel Island to a 15,000-square foot pet park and around 20,000 square feet total for a job that involved three homes on Isle of Palms,” said Huggins. 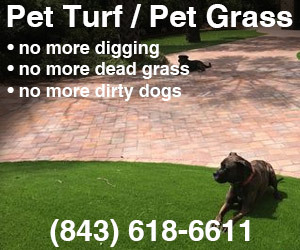 To learn more, visit www.palmettomoonsyntheticturf.com or call 843-618-6611.